On Saturday, October 10, 2015, Michael woke up at 3 am very confused and not speaking clearly. His wife, Megan, took him to the emergency room and after a CT scan the Dr. said he had bleeding on his brain – they were then transferred to the Neurology ICU Unit. Michael was diagnosed with Dural Venous Sinus Thrombosis. Two days later, he was rushed into emergency surgery at midnight to help reduce the severe swelling/pressure on his brain by removing a portion of his skull (Decompressive Craniectomy). This surgery saved his life. He spent 20 days in the Neuro ICU, 7 days on the Acute Neuro floor, and 40 days at a Rehabilitation Hospital where he learned how to walk and eat again, with much success. However; since his brain injury, Michael has Aphasia, where he knows what he wants to say, but he has trouble thinking of the right words to speak, so communication is difficult for him. Michael discovered his hidden talent for art at an Aphasia support group at Butler University. 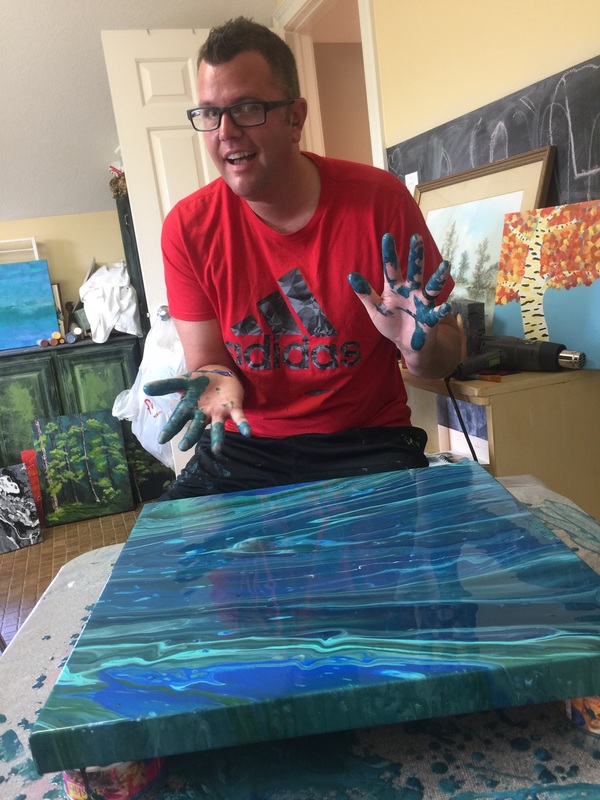 For someone who never painted before his brain injury – he is really good! He has a creative eye for color and his ability to paint such beautiful artwork is simply amazing and a true blessing from God! Michael also enjoys cooking, playing golf, traveling, going to church, spending time with friends/family, his dogs; Divot & Birdie, and his wife of 4 years, Megan. They both thank you for your love, support, and prayers. ~ You can also place a custom order with Michael and pick the size and specific colors you’d like in your unique painting by filling out the Custom Order Form. “For I know the plans I have for you, declares the Lord, plans to prosper you and not to harm you, plans to give you hope and a future.” Jeremiah 29:11. Click HERE to complete a request form.